Artwork by Thorny Thoughts Artwork. It’s often a mystery why some bands explode in popularity, while other equally talented bands wallow in obscurity throughout their existence. Whether it is a case of location, lack of press coverage, poor distribution or just plain old bad luck, it is a shame that excellent bands like Darkened Nocturn Slaughtercult don’t get the recognition that they deserve. Releasing their first demo in 1999, the Germans have not released a bad album in their 10-plus year career. While Necrovision, their fifth full-length, is by no means new, it’s limited availability (at least here in the States) and only recent appearance on Bandcamp will make it new to many listeners. And like all the band's previous works, it offers a plenty of aural pleasures for any fans of second-wave black metal. Nocturn does follow a fairly traditional black metal template, but they are far from the one-trick, one-dimensional copycat bands that are so prevalent these days. They have continued to hone their sound and songwriting technique over the years, imbuing each and every song with a dark spirit and individual nature that ensure they hold up over repeat listens. The critical component in this is the band’s understanding and use of dynamics. Instead of endless blasts and homogenous dirges, each of Necrovision’s nine songs (excluding the typical throwaway ambient intro) guide the listener through a series of twists and turns, culminating in a diverse and highly satisfying journey into the darkness. MDF 2015. Photo by Ashley Adams. Interestingly, the first thing that jumped out on early listens was the spectacular drum performance by Horrn. While he can blast with the best of them, he opts instead to use this technique as an accent instead of the template around which all the songs are built. This helps guarantee that when a blast is employed, it gets the listener's full attention and delivers all the impact of a mac truck colliding with a mini cooper. More impressive is Horrn’s deft usage of fills. He intuitively understands how to use them as accents to help propel the song forward and keep the listener’s attention, without ever sacrificing the underlying beat’s groove. Equally comfortable with a rollicking mid-paced stomp as an all-out percussive onslaught, Horn provides a diverse and powerful backdrop against which Velnias and Onielar overlay their powerful riff work. The dynamic drum performance is matched by the excellent riff work provided by this duo. As with the drum work, it’s the variety here that helps make Necrovision stand out from its peers. Whether it’s a slower atmospheric build, mid-paced groove, or concussion inducing blitz, Onielar and Velnias seem to have the perfect riff. Equally impressive is their ability to seamlessly blend these tempo changes together, highlighting their adept songwriting skills. This duo shows the same keen understanding of song craft that Horrn does, enabling them to maximize the impact of each and every riff they play. No single hook or melody overstays it’s welcome, constantly shifting and evolving, often leaving the listener begging for more and guaranteeing future listens. The warm production sound is a boon here as well, helping differentiate the band from the slew of black metal bands mining the “icy northern” riff style of their infamous Norwegian peers, and allowing their contagious melodies to firmly sink their hooks in the listeners damaged brain. Vocally, Onielar delivers the goods as well. 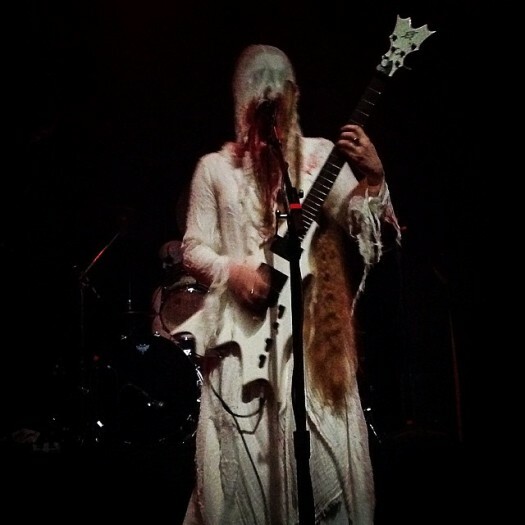 While her performance is quite traditional and certainly not as varied as her superb display on the latest Bethlehem release (a must listen if you haven’t already), her harsh croak lays perfectly on top of the music imbuing it with occult atmosphere and satanic might. 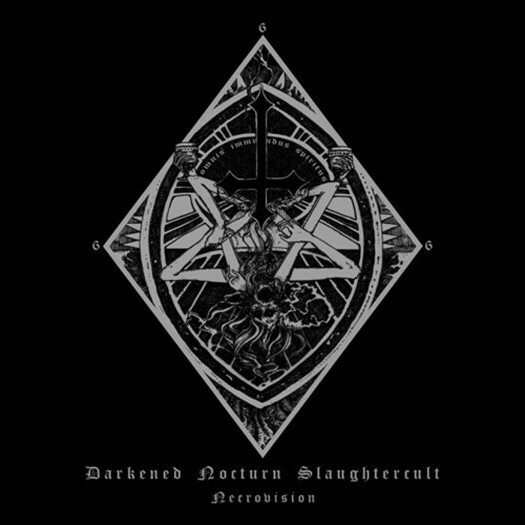 If you have heard Darkened Nocturn Slaughtercult before, rest assured that the quality of their back catalog is maintained, and if you're new to the band Necrovision is as good a place to start as any. One thing is for sure, this Germanic black metal institution is one that you need to add to your collection.